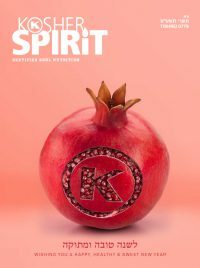 Home > Kosher Spirit > Fall 2018 > Sous Vide: Sink or Swim? The month of Tishrei is filled with Yomim Tovim, and all of these, even Erev and Motzei Yom Kippur, include the mitzvah of seudas Yom Tov with basar v’dagim. While the primary focus of Yom Tov is our Divine service and unique mitzvos associated with each day, the seuda holds an important place, as well. With more than twenty special meals to prepare over the course of the month, and oven space at a premium, many look toward the sous vide as a way to innovate their menu and multi-task in a busy household. The sous vide has taken the cooking world by storm, but as observant Jews we have to look beyond the culinary aspect of the trend and delve into the potential halachic concerns for this unique kitchen appliance. Sous vide (pronounced suːˈviːd), which means “under vacuum” in French, refers to the process of vacuum-sealing food in a bag, then cooking it to a very precise temperature in a water bath. This technique produces results that are impossible to achieve through any other cooking method. Cooking via sous vide is accomplished by filling a pot of water and inserting a sealed bag with the food that one wishes to cook. A device called a precision cooker (essentially a heat element) is inserted in the water and it circulates the water while heating it evenly and precisely. Often the food can remain in the pot for an extended period without being “overcooked”, and the food will be cooked evenly all around. As with all new fads, there are many companies manufacturing sous vide precision cookers with a variety of features and precision levels. Members of our OK Kosher rabbinic team and other staff have reviewed a few of these brands to get a better understanding of how sous vide cooking works and suggest where there may be some halachic impact (see side bar). The following is related only to the sous vide device that is attached to a pot or container; sous vide cookers that are built-in to a pot and cover may have different halachic applications. Because this immersion device is heated, all considerations regarding kosher cooking would be applicable. According to Halacha, anything that is cooked in the same water at the same time is considered one entity and the “tastes” of all of the ingredients are considered blended throughout the pot. In addition, any “taste” that can penetrate from one food to another can also penetrate non-food material if heated together. Therefore, although the food is in a sealed bag, the “taste” of the food will travel to the water and throughout the pot. One may certainly not cook meat and dairy simultaneously in the pot, even if they are in separate bags, nor may one use the same device for both meat and dairy. Anything cooked using a sous vide device that was used for meat will have the same Halacha as if it was cooked in a fleishig pot. If a mistake occurred, and a fleishig sous vide device was used with dairy, or vice versa, the device must be kashered. There is a rabbinic prohibition against cooking/mixing meat and fish together (for health considerations); therefore, one may not cook meat and fish simultaneously with a sous vide device. According to most Poskim, however, one need not have a separate sous vide cooker and pot for meat and fish. A sous vide device that was used all year for chometz may not be used on Pesach. In addition, some models contain plastic and should not be kashered for use on Pesach. The next important area of halachic relevance is Shabbos and Yom Tov. Certainly, one may not cook on Shabbos and, therefore, even if the device was turned on before Shabbos, one would not be permitted to add any food to the vessel on Shabbos. May one turn on a sous vide cooker and place food inside before Shabbos, with the intention to serve the food at the Shabbos meal? The Torah only prohibits a melacha that is done on Shabbos, but doing a melacha before Shabbos, even if the melacha will continue working on Shabbos is permitted. For example: one may not light a candle on Shabbos, but we all light candles before Shabbos that remain burning on Shabbos. Chazal, however, have imposed a few exceptions, including cooking. Chazal do not allow one to leave food on the fire to cook on Shabbos out of fear that one will stoke the flames on Shabbos to quicken the cooking process. Stoking the flames includes two prohibitions: kindling and extinguishing. To avoid violating these prohibitions, there are a number of permissible options. The first option is to have the food cooked before Shabbos, thereby avoiding the necessity of adjusting the fire. The degree to which the food must be cooked is the subject of a debate amongst the Rishonim. According to most Poskim, as long as the food is half cooked it can be left on the fire over Shabbos. This would seem to be a viable option because sous vide technology allows the food to remain heated, without “over-cooking”, even after it has been cooked completely. According to those that accept a stricter view, and do not allow food to be left on the fire unless it is completely cooked to the degree that any further cooking is detrimental to the food, the sous vide can be used only if the food is already fully cooked before Shabbos. If the food is only minimally cooked (or, according to some, as long as it’s not over-cooked), Chazal give other options to allow it to continue to cook on Shabbos: Gerufah – Removing the coals from the oven, or Ketumah – covering the flame. Both options prevent the person from stoking the flames, but there is an important difference. Gerufah makes it impossible to stoke the fire because there are no coals, but with Ketumah, one can technically remove the cover and stoke the flames. Nevertheless, Chazal allow Ketumah because the cover acts as a reminder and we are not concerned that someone will go out of his way to remove the cover and raise the temperature. Today most people avail themselves of the Ketumah option by placing a “blech”, a metal sheet, over the fire. In the case of sous vide because covering the heat element is not possible this option is not applicable. There is yet a third option. Raw meat may be left on the fire from the beginning of Shabbos. Chazal were not concerned in this case that one will increase the fire on Shabbos, because even an increased fire would not prepare the food for the Friday night meal. For the Shabbos day meal, where significant extra time is available, increasing the fire is not necessary. One would therefore be permitted to place completely raw meat – right before candle lighting – in the sous vide cooker. If it is placed earlier, then it would have cooked somewhat before Shabbos and not fall within these guidelines. All the above is only if the food is on a regular fire where the food will most likely be eaten on Friday night. If the food is “insulated” (Hatmana) where it can maintain heat till tomorrow, Chazal were stricter and do not allow even if the above requirements are met. The basic guidelines for Hatmana is that the food be completely covered, and the cover hugs the pot. If the pot is partially uncovered, or in an oven (where the “cover” is not directly on the pot), then it would not be considered Hatmana. Shulchan Oruch (brought from the Gemara) states that pulling a pipe/tube of cold water through a bath of hot springs (Chamei Teverya) is considered Hatmana. In addition, Acharonim clearly state that placing a vessel that contains food and immersing it in water would be considered Hatmana. The food is not placed in a heated pot; the water and food are being cooked simultaneously. The bag is meant to protect the food from crumbling, but is not intended to insulate. The food is visible through the water and bag. There is no lid on the pot. When a pot that remains on the blech for Shabbos, one may not remove the food while it is on the fire, because removing the food will result in stirring the contents and it is considered aiding in the cooking process. Sous vide does not fall into this category, however, and the food can be removed from the pot on Shabbos. There is no issue of stirring, because the top of the bag is sticking out of the water and there is no need to insert a spoon in to the water. In addition, the motor constantly circulates the water and the insertion of a spoon would add nothing to the stirring process. On Yom Tov one is permitted to cook; therefore, one may use the sous vide device on Yom Tov without the above concerns. In addition, one may even be permitted to add food on Yom Tov into a sous vide cooker. It is permissible to cook with the sous vide, but one cannot turn on, adjust or manipulate the settings of an electronic device. Therefore, the device must be turned on from before Yom Tov, or set on a timer, before Yom Tov, to turn on at the desired time. Our research has found that putting in cold food into the pot, will not directly trigger the device to “adjust” the temperature and can be considered merely a grama (indirect method), which is permitted. Only cooking for that day is permitted on Yom Tov; therefore, one may not place food in a sous vide if one intends to eat it the next day. One may place meat in the sous vide bath at night for the following afternoon. When an Eruv Tavshilin is made, one may cook on Friday for Shabbos; however, all guidelines for Shabbos and Eruv Tavshilin (i.e. the meat needs to be edible before Shabbos) must be followed. There is a discussion amongst the Geonim whether one may insulate (Hatmanah) food on Erev Yom Kippur for after Yom Kippur. Although the Halacha is that it is permitted, some Ashkenazic Jews have the custom to avoid this. All food contact utensils require Tevilas Keilim; however, if the food is only used while it is placed inside a bag without ever touching the keili, it does not need to be toiveled. A sous vide device is meant to be used without direct contact with the food and would therefore not require tevila. One must have separate sous vide devices for meat, dairy and Pesach. On Yom Tov one may leave the sous vide cooking and one may add food to it on Yom Tov if it will be eaten that day. There is a discussion amongst the Poskim whether sous vide would be violate the prohibition of Hatmana and if it may be used on Shabbos. We tested the following brands of sous vide cookers in the office and found them to be acceptable for use following the guidelines in the article. $179-199, controlled via smartphone app. The Joule featured the most sensitive temperature accuracy as well as sleekest, lightest design. While it was rather bulky, it performed well and had great temperature accuracy. Works with Wi-Fi. Good temperature accuracy. The most budget friendly of our testers, with good temperature accuracy. Performed well, good temperature accuracy. As with all matters of Halacha one should speak to their Rav for a personal psak. OK Kosher and Kosher Spirit would like to thank Rav Dov Schochet, a Rav at the Shul of Bar Harbour in Surfside, Florida, for his thorough review of this article. Although the sous vide does not overcook the food when left at the prescribed temperature, the food can still be ruined if a person were to change the temperature on the sous vide. When left at the prescribed temperature, it does not further the cooking process, it just maintains the warmth of the food.